Facility Size: 164,000 sq. ft. Being an essential link between patients and health care, Cardinal Health provides solutions that reduce costs throughout the healthcare industry. With over 30 large distribution centers in the United States, delivering essential medical supplies to hospitals, surgery centers, and end patients is a time sensitive and life-critical business. Facility uptime, order accuracy, and employee safety are top priorities for the facilities staff at Cardinal Health. The team at Cardinal Health worked with Relumination to assess each of their 30+ distribution center facilities to create an action plan that addressed light levels, energy-efficiency, and technology. The plan was simple; improve the working conditions, reduce energy and maintenance costs, and deploy a repeatable and consistent solution. 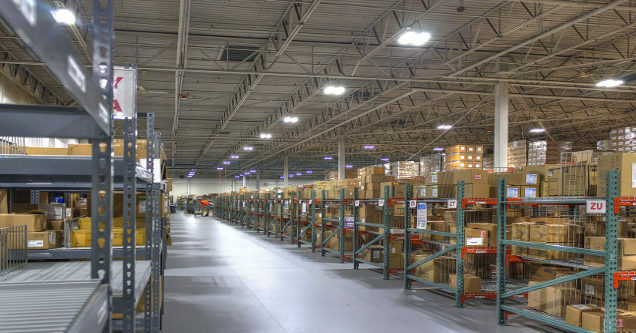 Their Tampa, Florida distribution center was the second site upgraded by Relumination and included the Digital Lumens LightRules control platform. With LightRules the facility staff can control the facility lighting, turning it from an expense to an asset, and dial in the right light levels and motion sensor timeouts for the type of work being done, and the time of day. Deploying the Digital Lumens system improved light levels by 50-90% throughout the facility while drastically reducing costly maintenance and electricity expenses. Warehouse employees like the improvement in light levels as well, commenting that they feel safer.